What was Masonry like in Boston during Colonial times? | King Solomon's Lodge, A.F. & A.M.
Due to inclement weather forecast for this week, this event has been postponed. We will be hosting “An Evening at the Bunch of Grapes” where the speaker will describe what early Freemasonry was like in Boston after Henry Price established the first Grand Lodge in America in 1733. Where did they meet before there were permanent lodge rooms? What did they eat and drink, and sing? Attired in period costume, RW Brother Graeme Marsden brings 18th century Boston to life with stories of early brothers and an intriguing show-and-tell of Masonic artifacts. Bro Graeme is active in the reenactments of numerous historical events and welcomes your questions. Feel free to bring friends and family to this event. 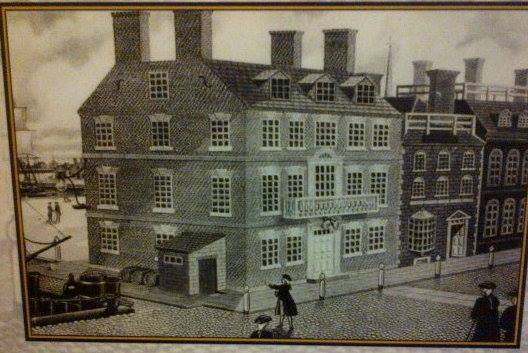 Below is a drawing of the Bunch of Grapes Tavern where our Grand Lodge was founded.